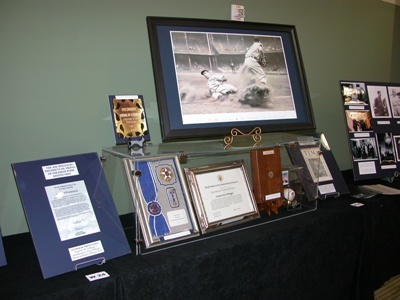 One of the big benefits of attending an OMSA Convention is the opportunity to view exhibits of rare and different material from fellow OMSA members’ collections. 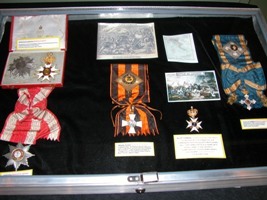 You will likely see orders and medals that you would not ordinarily see anywhere else. Exhibiting at an OMSA convention is open to any OMSA member who registers for the convention. 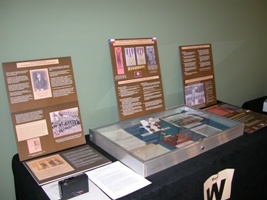 The cases and tables for anyone who wants to exhibit are free of charge! The size or scope does not have to be big. It is enough to share your interests with others, no matter what the scale. Exhibiting not only gives the viewer a beneficial education, but gives the exhibitor a chance to establish a name in the collecting community to increase your collecting network and a gain a sense of achievement for doing so. Competitive awards are another incentive and come in the form of bronze, silver and gold medals as well as Best of Show. Sometimes special theme awards are given at the discretion of the Convention Chairman. There is also a Vice President’s Award for the best exhibit under $200 in value so that everyone can compete regardless of the rarity of the material. One can even enter in a non-compete category just for the pleasure of showing off pieces in your collection. For those of you who have never exhibited before, the Exhibit Rules (attached for reference) will be strictly enforced to receive a competitive medal. So make sure you review these rules ahead of time and plan accordingly.